Just like in any other apps, not everyone prefers a note-taking app that is jam-packed with features that they don’t even understand. Some prefers simplicity over complexity so it’s quite nice to know that when it comes to note-taking apps, the choices aren’t limited. Speaking of which, those who prefer a simple note or memo app with sync support can try this app called Sync Notes. 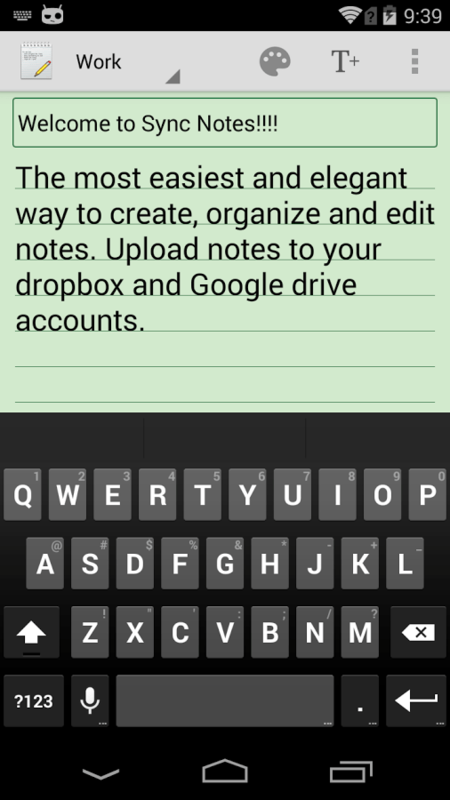 Sync Notes is a simple note-taking application for Android with sync support. With this app, you can create and sort out notes with ease. You can also sync your notes to your Dropbox or Google Drive so you can easily restore them just in case something goes wrong with your phone. Furthermore, Sync Notes flaunts a simple and straightforward user interface so it’s more suitable for users who just want to write and keep some random notes. The sync option must be done manually plus all of your synced files will be stored on your cloud storage’s root directory. They won’t be automatically sorted out in a separate folder. You can’t send or share your notes across devices via email, Bluetooth, etc. When it comes to note-taking apps, I prefer an app that’s simple yet efficient to use. As for Sync Notes, it’s a simple and straightforward app. 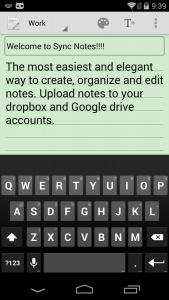 It lets you create notes on the fly and sync your notes to Dropbox or Google Drive. Once installed, you can use the app right away. Just tap its “+” to create a new note. Keep in mind that your note will be automatically saved as soon as you press the back button. Apart from this, the app will automatically sort out your notes by date. On the app’s main menu, you can choose your preferred sync location. Since the app only supports two cloud storage services, you can either log in to Google Drive or Dropbox. The choice is yours. 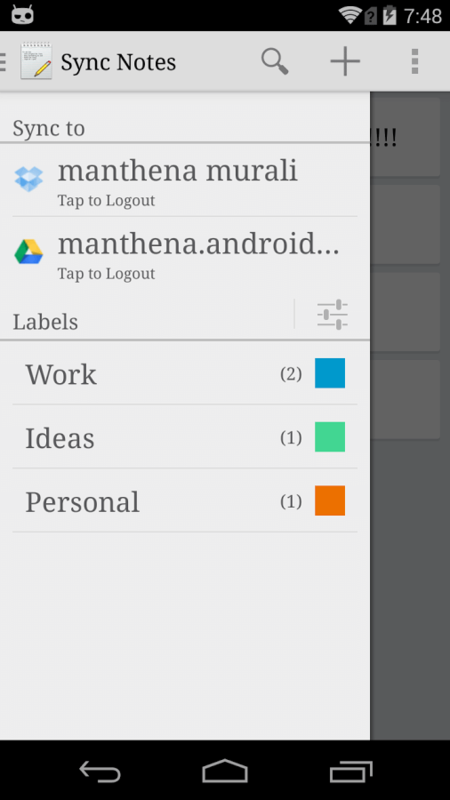 You can also assign labels to your notes. By default, Sync Notes has already provided some labels that you can use or modify. To assign a label to an existing note, just click the drop-down menu that’s located on the top-right portion of your note editor. Another thing that I like about Sync Notes is that you can change the theme or color of the editor. You can also change the font or make the text larger. Apart from this, you can also opt to secure the app by enabling its lock screen. The lock screen uses a four-digit PIN. So every time you launch the app, you will be asked to enter the correct PIN. Just keep in mind that there’s no way for you to recover a lost or forgotten PIN. All in all, I can say that Sync Notes is a decent app for simple note taking. I just don’t like the fact that it doesn’t automatically sync your notes. As a matter of fact, you have to select the notes manually before you can sync them to your preferred cloud storage location. Apart from this, the app’s editor also lacks support for landscape mode so it’s not really that suitable for tablet users. There’s also no way for you to send or share your notes across devices via Bluetooth, SNS or email. 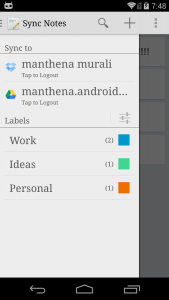 Sync Notes for Android is a decent note-taking app. It works fine without any bugs or glitches plus it offers a really simple way to sync your notes. In other words, it is more suited to those prefer to keep things as simple as possible. It’s not as advanced as Google Keep or as feature-packed as Evernote but it’s still worth checking out. So go ahead and feel free to give it a try.